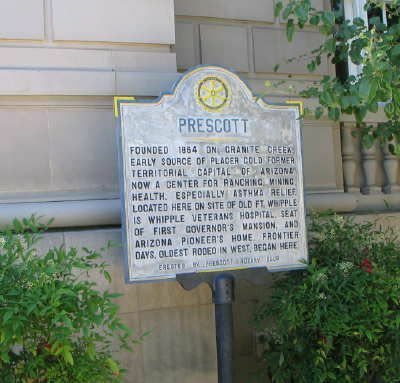 Prescott, Arizona was Arizona's first territorial capital. Prescott was founded after the gold rush of 1863 and boasts more than 500 buildings on the National Registry of Historic Places. Here in Prescott, you'll learn about Teddy Roosevelt and the Rough Riders, Tom Mix, Doc Holliday, the history of the Goldwater family, hear how the rodeo began, learn about the Yavapai people, and much more. PRESCOTT. FOUNDED IN 1864 ON GRANITE CREEK. EARLY SOURCE OF PLACER GOLD. FORMER TERRITORIAL CAPITAL OF ARIZONA. NOW A CENTER FOR RANCHING, MINING, HEALTH, ESPECIALLY ASTHMA RELIEF. LOCATED HERE ON SITE OF OLD FT. WHIPPLE IN WHIPPLE VETERAN'S HOSPITAL. SEAT OF FIRST GOVERNOR'S MANSION, AND ARIZONA PIONEER'S HOME. FRONTIER DAYS, OLDEST RODEO IN WEST, BEGAN HERE. Within 2 or 2-1/2 hours from most locations in the Phoenix area, Prescott, Arizona makes a great day trip for both adults and children. There's so much to do! Yes, of course, Prescott is now a modern city, with a mall, and a megaplex movie theater, and Starbucks. On this trip to Prescott, Arizona, however, we'll be concentrating on the old part of town--the center of town, where it all began. There are even places to stay if you want to extend your visit. When you get into downtown Prescott, find parking as close to the Courthouse Square as possible. Gurley Street is the name everyone knows as the east/west main street downtown. Courthouse Square is bounded by Gurley, Montezuma Street (Whiskey Row), Goodwin, and Cortez. We found that the easiest place to park was about a block away, in the municipal lot on Cortez, just south of Courthouse Square. The first thing we did was visit the Chamber Of Commerce Visitor's Center, where you can get great maps, brochures, and information about the area. First things first--the public restrooms are at the base of the Courthouse, on the Whiskey Row side. It's across the street and less than 1/2 a block from the Chamber of Commerce building. Here's where you'll get your first glimpse of Whiskey Row. More than a hundred years ago, this is where the miners and other residents took their meals, drank their liquor (the water wasn't safe), got haircuts, found jobs, voted, and found entertainment. The brothels were on the second level. Even 20 years ago there used to be more bars on Whiskey Row, but now, in addition to some of the traditional places, you'll find art galleries, ice cream shops, and gift shops. Whiskey Row is a popular destination for people from all over the state on the 4th of July when Frontier Days celebrations take place, including the World's Oldest Rodeo. Right on Whiskey Row, stop at the Palace Restaurant and Saloon. The burgers are great! The Palace Bar has been open since 1877, and it is the oldest frontier saloon in Arizona. Take a walk to the back room and see the huge paintings on the walls, including the one commemorating the filming of Steve McQueen's Junior Bonner at that location. The original Palace Bar was destroyed in the Whiskey Row fire of 1900. The bar, itself, was removed to safety and reinstalled when the saloon was rebuilt in 1901. In May 2012, a fire destroyed the Bird Cage Saloon on Whiskey Row, a local landmark, as well as all of the contents of the saloon. Larry & Hy's Bare Bones BBQ and the Prescott Food Store were also destroyed by the fire. The Yavapai County Courthouse is in the center of downtown activity. Walk around the front to see the Rough Rider statue. The Courthouse Plaza is a busy place on most weekends, where craft fairs and community entertainment are common events. Check the City of Prescott event calendar to see what's going on. There was a festival with entertainment going on the day we were here. People filled the Courthouse steps, brought blankets and chairs for the grass, and enjoyed the shade from the large trees that are all over the square. Families, couples, bikers--all of them have dogs that enjoy this park! The Smoki Museum, Fort Whipple, and the Citizens Cemetery. Take a leisurely drive through the historic neighborhoods of downtown Prescott, with the beautifully restored Victorian homes and the historic hotels. The Sharlot Hall Museum is the largest museum in the central territory of Arizona. In 1909, Sharlot Hall was named Territorial Historian and became the first woman to hold territorial office. Sharlot Hall started the museum in 1928, comprised of her collection of artifacts and historical documents. She moved them to the Governor's Mansion, which is preserved on the grounds and can be visited today. The Sharlot Hall Museum has both permanent and special exhibits, living history programs, and outdoor theater performances. There are several festivals that occur annually at the museum, such as the very popular Arizona Cowboy Poets Gathering. Also on the property for your viewing pleasure is the ​one-room schoolhouse, the Ranch House, Fort Misery, the Governor's Mansion, and the print shop. If you still have more time, or you are staying the weekend, there are many more options. The Smoki Museum showcases American Indian art and culture. The Smoki (pronounced smoke'-eye) were Prescott residents--not native peoples--who were dedicated to preserving the knowledge of American Indian culture. The Phippen Museum of Western Art is on the way out of town, toward Sedona on Highway 89A. The Heritage Park Zoo "is a non-profit facility dedicated to the conservation and protection of indigenous and exotic animals." Finally, if you enjoy hiking and boating, there are 1,600 acres of parks and miles of hiking trails in the Prescott area. Watson Lake permits overnight camping and is within a few miles of downtown Prescott. Go North on I-17 State Route 69. Go Northwest on State Route 69 into Prescott. From most places in the Phoenix area, you should be able to get to Prescott within about 2 to 2-1/2 hours. Prescott, Arizona is at an elevation of about 5,300 feet, so it's a bit cooler than it is in the Valley of the Sun. In the winter, Prescott transforms into "Arizona's Christmas City." One thing is clear about Prescott, Arizona -- one visit just isn't enough.